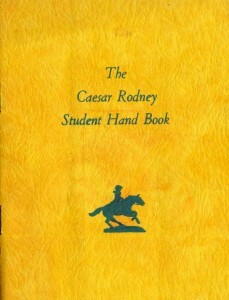 The Caesar Rodney Student Hand Book was originally printed in 1935 and then revised in 1938. 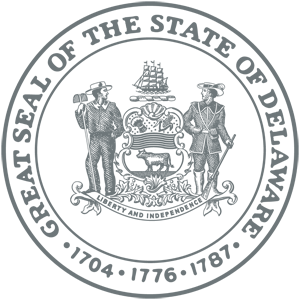 The handbook is broken down into six chapters: school activities, a history of the school and its building and grounds, program of studies, awards, honors, and the point system, extra-curricular activities, and athletics. 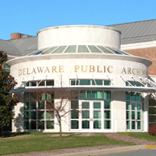 The Caesar Rodney School officially opened in 1916. This handbook provides background on the school’s beginnings and the changes they had seen since 1916. With the growing enrollment and consolidation of a number of rural schools, the need for a larger building was necessary. In 1921, a wing was added to the original building and later an additional wing and gymnasium. At this point, grades 1-12 were all located under one roof. 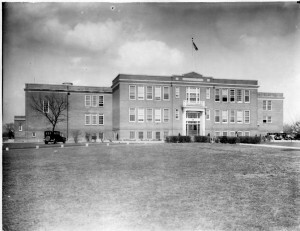 In 1934, they expanded again and created a building for the high school and that was connected to the original structure. When this handbook was created the enrollment for the twelve grades exceeded 700 students. School activities included a Halloween dance, the Dover-Caesar Rodney Football game on Thanksgiving Day, senior play, Junior Prom, Senior Trip to Washington, All School Banquet, and baccalaureate sermon. 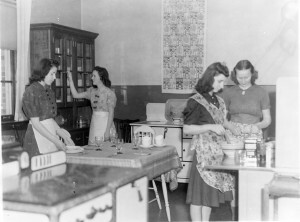 Vocational Home Economics: for girls who wanted their life vocation to be home making, nursing, etc. In addition to the programs of study, students had the opportunity to take special subjects such as manual arts, mechanical drawing, auto mechanics, art, and music. Awards and honors included National Honor Society, earning an All School letter, and scholarships. 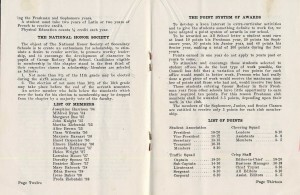 The handbook detailed how to qualify for National Honor Society and lists the members from 1934-1938. 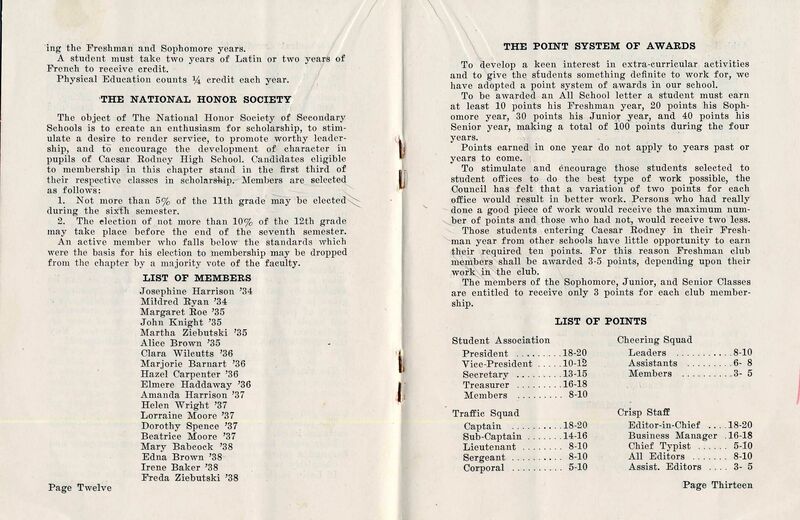 Introduced as an incentive program for students, a point system was adopted for students to earn awards. If a student earned 10 points freshman year, 20 points sophomore year, 30 points junior year, and 40 points senior year they would be awarded an All School letter. Points were awarded for involvement in school activities and associations. A list of students who received All School Letters is listed in the handbook. Student Association: organized for the purpose of bringing all student organizations under one head, helping to maintain law and order, and supporting all school activities. The Traffic Squad: helped and maintained order in halls before school and between classes, plan and direct fire drills, work with the Safety Council for the safety of children on the playground. The Crisp: the school magazine that was published quarterly. Assemblies: held at the Caesar Rodney School to promote school spirit, give students a broader education, and offer an opportunity for students to express themselves. Safety Council: in charge of safety regulations outside the building. Dramatic Club: helped students speak more freely and without difficulty in public as well as to teach them to become better actors and actresses. Manners and Etiquette Club: organized to teach students to meet situations gracefully. Library Club: helped boys and girls to learn more about books. Bachelor’s Club: organized to provide an opportunity for boys to put on an apron and learn a few of the “finer” arts of housekeeping. Agriculture Club: the Caesar Rodney Chapter of The Future Farmers of America. Handy Club for Girls: girls learned to construct small household items and make minor repairs around the home with ordinary hand tools. Home Craft: composed of boys who have a special interest in building small articles of household furniture. 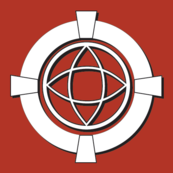 Junior Girl Reserves: a branch of the Y.W.C.A. The group sought to help girls ages 12-18 develop a well-balanced personality, grow physically, and take on social responsibility. 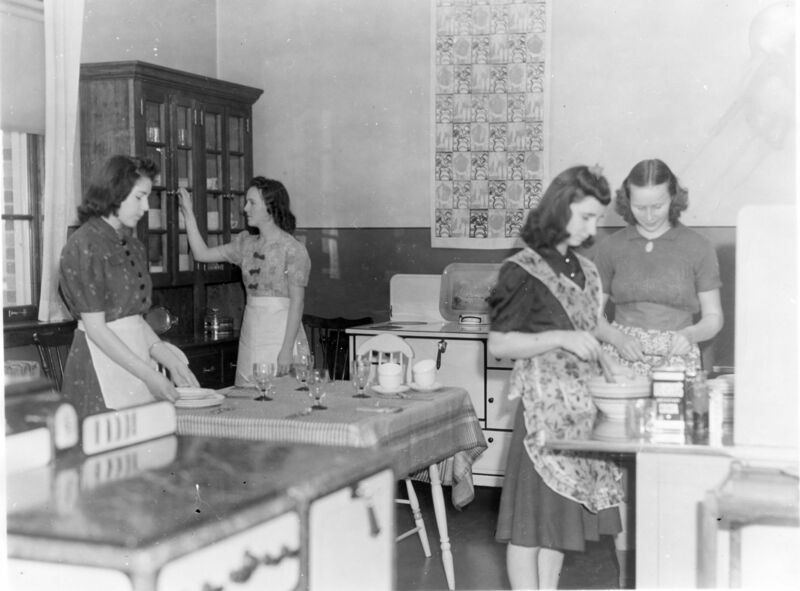 Home Economics Club: teach girls how to knit, cook, and how to act in company. In 1938, Caesar Rodney had football, basketball, baseball, and track available for boys to participate in. Football had recently been added to the handbook, replacing soccer. Girls could play basketball or volleyball, and also had physical education classes. As we celebrate one hundred years of the Caesar Rodney School District, it is exciting to be able to look back through this handbook and see how far the schools have come in the past 77 years.